THE MAN ON THE GREY. – A HUNTING EPISODE. A subdued neigh greeted my jingle of bridle and saddle as I crossed the yard: the little mare had her mouth full, and with her customary lack of manners, had tried to speak and eat at the same time. I answered her with a huntsman’s screech, and saw the flash of steel and flying straw as she lashed out, her method of telling me that she was ‘ scraping her feet ‘ to be off. Having successfully avoided the friendly nips of her ladyship, who always objected to being girthed up, I mounted, while the mare tried to qualify for a spinning minnow, and in another moment we were off, progressing in a series of bucks and bounds; but she soon settled down into the low, easy stride which made her such a perfect hack: there was no pulling or stumbling, whilst mile after mile would be covered at the same easy pace, and the reins might hang loose on her neck. 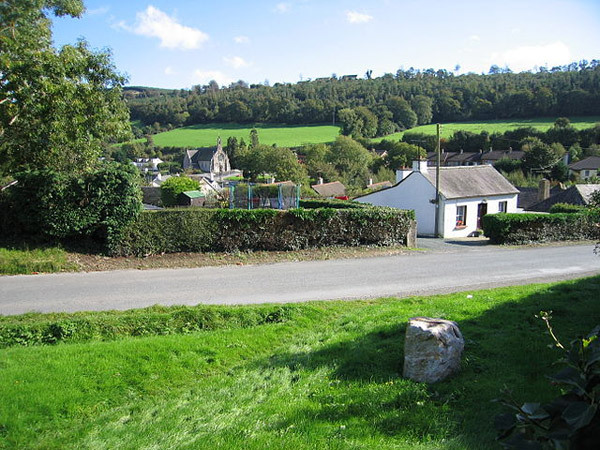 The meet, seven miles away, was at the cross-roads of Ballydreugh, overlooked by one of those picturesque old graveyards, long since disused, and enclosed by a crumbling stone wall, which allowed the cattle to stray in and keep the grass short. The hunt was not a fashionable pack, and none the worse for that, showing as they did good sport over a fine scenting country. The field numbered from fifteen to perhaps forty, and rat-catching attire was more in evidence than scarlet; but they were keen sportsmen and hard riders – the times were also hard, and what matters the turnout ? Strangers were rarely seen, and were regarded as curiosities to be criticised and ‘ taken care of ’ when they did put in an appearance. Hounds were just moving off as we arrived, to draw a small covert of gorse and undergrowth along the banks of a ravine. The field was of small dimensions, all well known to one another, and, as usual, the talk was of horse-coping, of the runs we had had, and the likelihood of sport that day. Sometimes one has to wait ages before a fox can be got to leave these thick gorse coverts; but on the present occasion we were not kept long in doubt. An eager chorus rippled through the covert, the gorse shook and quivered, and we caught occasional glimpses of lashing stems and a head raised to give tongue. Old stagers pricked their ears, young ones grew restless, there was a general shuffling, cigars thrown away, hats pressed down firmly, girths tightened, whilst the rival factions were jealously ” schaming ” for a start. Then, with a slight rustle of dead leaves, out stole an old dog-fox. In place of a brush he carried a short bob-tail like a sheep-dog; he was grey with age, or perhaps wisdom, and he lingered a moment calmly listening to the hounds in covert, and then, without any hesitation, he set his mask in the direction of Glenealy  and slid away down the hill. ‘ Tally-ho! gone away! ’ yelled the whip, with a bloodcurdling scream that made one’s hair stand on end with excitement, whilst horses began to kick and plunge. In another moment the hounds streamed out to the gay little twang of the master’s horn; down went their noses as they swooped and circled, then “ Hark to Royalty ! Forrard – forrard! ” and with a burst of melody they flashed away on a breast-high scent. There was no doubt about my getting a start, for the mare, simply frantic, and already in a white lather of excitement, was off with a bound, whilst the first fence, a narrow bank and ditch, seemed to be racing towards us. This she flew in her stride without deigning to touch it, nearly dropping her legs in the ditch beyond, but with a lurch and scramble we were on again. After two or three fields she became a little more reasonable, although, as her custom was, she chanced every fence, landing now on her head, now sliding down on her tail, but rarely landing in a conventional attitude. The field by this time was a bit scattered. On my left Father O’Donnel, the best-turned-out man in the field, was going for all he was worth on his good little chestnut, with two hard riding farmers jumping in his tracks; the master, whose scarlet had already come into contact with a boggy drain, was two fields behind and riding cute for the point; a lady was down, and two men were assisting to pull her horse out of a deep ditch – only its head was visible; and then suddenly I became aware of a man in front of me – a stranger riding a long-tail grey. If he had landed out of a flying machine I should not have been more surprised; his sudden appearance was a mystery. At any rate he was a fine rider, and the couple slipped along over fields and fences without apparent effort. The pace was beginning to tell, and it was with relief that I saw hounds brought to their noses: the line had been foiled by cattle. As I came up with the stranger, he turned in his saddle: the brief glimpse I had of his face seemed to photograph itself on my brain with extraordinary vividness. I realised vaguely that there was something quaint about his general appearance, but, at the time, one could only notice his eyes: they were of a haunting sadness, and when for a brief second they met mine, the effect was startling. I felt as though some one had thrown a bucket of ice-water over me. The next moment Harmony had puzzled out the line, and they were away again. Feeling as though I were in some horrible nightmare, I followed the lead of the man on the grey. Only now I watched him with an anxiety that was becoming horrible. We were coming to a bank with a blackthorn hedge on the top; the grey horse rose at it and flitted over, for all the world as if it had been a soft grey moth – not a twig stirred. A horrible suspicion flashed through my mind; but no, it was too insane. Suddenly a thought struck me, and I leant down over the saddle, eagerly searching the ground for the track of his horse’s hoofs; the country rode very deep, and my own mare was leaving a brown track in the green turf, but the grey slid on and left no hoof marks. I put my hand down on the saddle to steady myself, for the grass seemed to be going round like a whirlpool under the mare’s feet. Suddenly she pulled up with a jerk and I slid to the ground. Thank goodness! the run was over, the old fox had beaten hounds into covert. Jim Conolly rode up on a steaming youngster with ‘ Gad, Miss, I never saw the little mare carry you better; you were giving us all the lead. ’ I looked round fearfully, but the grey and his rider had vanished; had Conolly seen them ? I summoned up all my courage: ‘ Jim, it was the man on the long-tailed grey who was giving me the lead: who on earth was he? ’ Jim stared at me in blank astonishment: ‘ Grey, ’ he kept on repeating stupidly. ‘ No, bay,’ I said, exasperated. ‘ There was no horse in front of you,’ said James, who was looking at me curiously. But I gave no time for further comment and made tracks home, leaving, I fear, the impression in Mr. Jim’s mind that something more powerful than cold tea had been in my flask. I referred no more to the grey, and took the ghostly experience for a ‘ warning ’ that my premature decease might be expected. Many hunting days came and went in uneventful fashion, and I was sadly puzzled over my experience, when one evening I found a clue to the identity of my sporting ghost. I was casually looking over some diaries belonging to my grandfather, relating to the terrible year of the famine,  when the potato crop failed entirely, and the natives were dying from starvation all over the country. One page black-lined arrested my attention. “ W.” (the master), poor fellow, never recovered from the shock. A few days later another entry related briefly the funeral of Mr. “ W.” at Ballydreugh graveyard, at which no priest officiated. One can imagine the horror of it all, his finding the hounds he had hunted for years for once unaccountably silent, and then his coming on them, guiltily crouching and snarling over the nameless ‘ thing ’ in the undergrowth that had crept there to die of starvation. So the master still hunts! Some of the old people I know have wonderful legends of a ghostly pack, that are occasionally heard in full cry, and I have no doubt that the grey horse and rider are flitting after them. But I hope sincerely that in future the M.F.H. will be satisfied to hunt by moonlight. The ‘great famine’ occurred between 1845 and 1852 and was one of the greatest catastrophies of the nineteenth century. 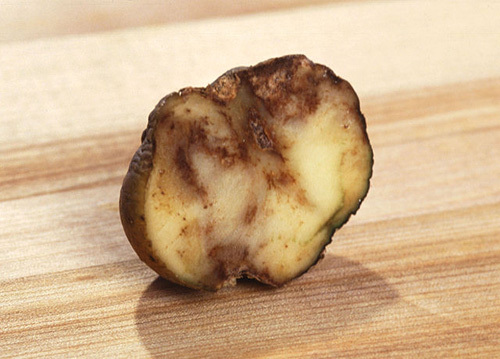 Blight ravaged the potato crops throughout Europe turning the potato into a soggy mass with a bad smell. The potato fields were not green with leaf but full of withered black stalks, and if travelling by night, you would know when a potato field was near by that smell. In Ireland it resulted in the deaths of many people from disease and starvation and and caused a decline in the population through emigration. Ireland had a growing population before the famine and by 1841 it had reached just over 8,000,000. Ten years later the census figures show a total island population in the aftermath of the potato famine of 6,552,385. At the time of the famine there was no cure for blight so there was nothing that farmers could do to save their crop. Scientists soon discovered that blight was caused by a fungus. They named it ‘Phytophthora Infestans’ but it wasn’t until 1882 that a preventative measure was found. This was to use a solution of copper sulphate (CuSo4) sprayed before the fungus had gained hold. Copper Sulphate turns bright blue in a water solution and is known as Bluestone. Historians trying to trace where the specific strain of Phytophthora Infestans came from have had to rely on shipping records and the knowledge that it originated in the Toluca Valley in Mexico, sometime after Europeans began colonising the Americas. In 2013, samples of 11 dried leaves, between 170 and 120 years-old, from Ireland, the UK, Europe and North America, were found in the collections of the Botanical State Collection in Munich and Kew Gardens in London. Although these plants are now extremely old, a team from the Sainsbury Laboratory, Norwich was successfully able to find extant DNA in them and sequence their genomes to track the spread of the blight over the course of the 1800s. It’s the first time that an ancient plant genome has been sequenced successfully like this. Looking through the genomes they recovered, the researchers found clear evidence that Phytophthora Infestans had undergone rapid diversification shortly after the arrival of Spanish invaders in the 1500s. It spread rapidly beyond the Toluca Valley to the rest of the Americas, and to Europe. The HERB 1 strain appears in the early 1800s, spreading to Europe in 1845 to begin the Famine. It only died out in the early 1900s, to be replaced by the US-1 strain that continues to destroy crops around the world to this day. The potato failed from blight but all other crops thrived. The country was full of food, which was taken away from those who grew it and exported mainly to English markets but from there found its way to many parts of the world. It puzzled many to hear there was famine in a land that had so much food to export.